I don’t know about you, but I am absolutely loving summertime! 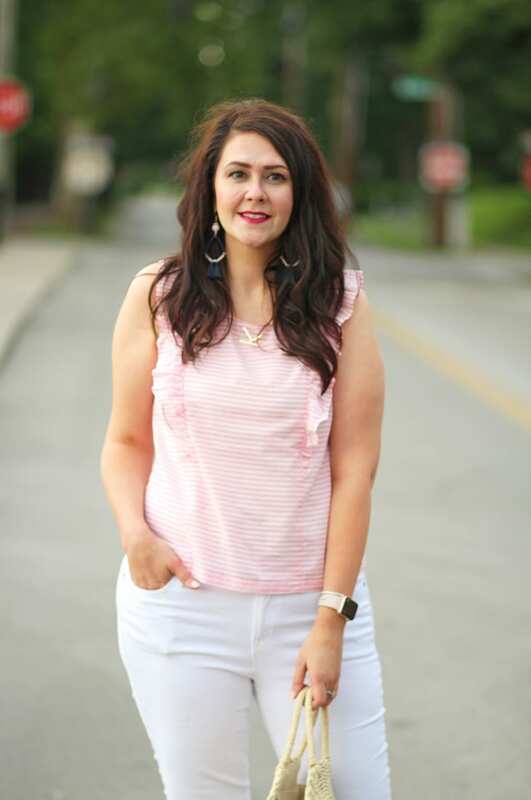 To celebrate the hotter temps, I thought I’d share my favorite style tips to help you achieve effortless summer style. 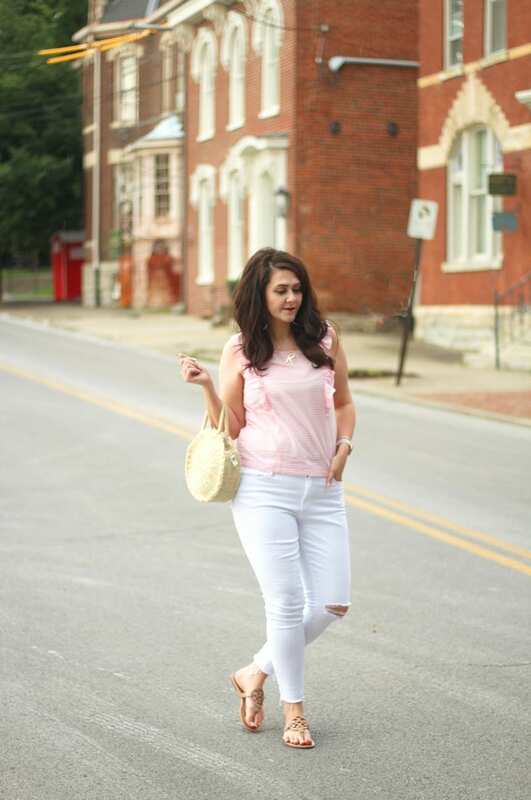 The #1 summer style staple you should have in your closet this summer is skinny white jeans with a raw hem!!! They literally go with EVERYTHING! You can dress them up or dress them down. They can look classy or edgy. I wear mine at least two days per week. If you don’t have a pair in your closet, what are you waiting for?!!! 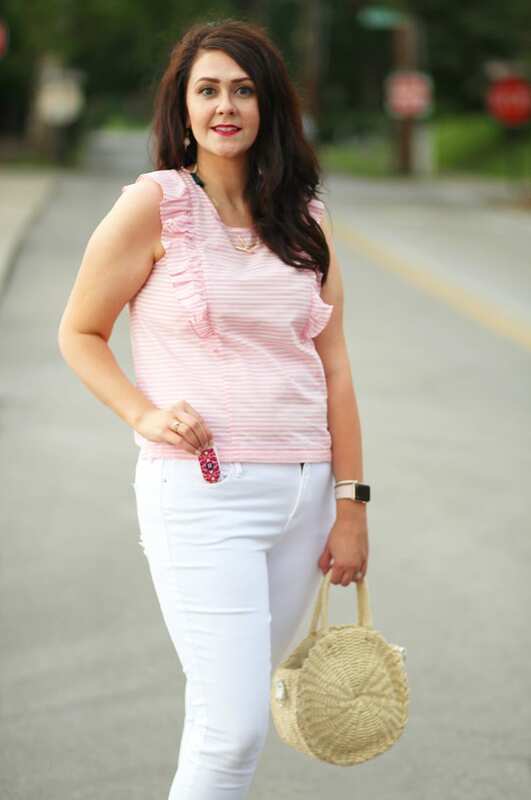 I wear my white jeans confidently all summer long with the new Tampax Pocket Radiant tampons. Not only are they small enough to fit in your pocket, but Tampax Pocket Radiant tampons feature Tampax’s width-wise expansion and LeakGuard Braid™ protection system, so you can wear summer whites fearlessly. Tampax Pocket Radiant tampons work well with summer’s other hot trends too! Whether you’re wearing a fun palm-print swimsuit or cutoff jean shorts, Tampax Pocket Radiant tampons have got you covered. Plus, you can easily pick them up at your local Walmart or order online. For summer tops, look for breezy pieces. 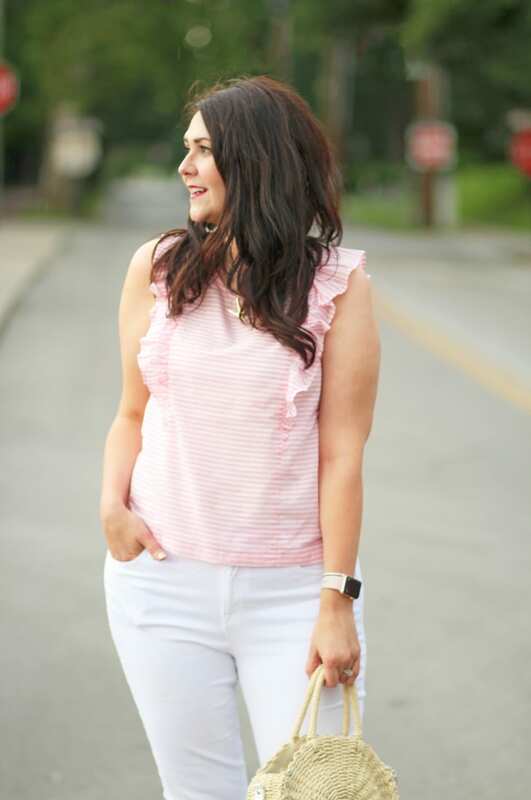 The ruffled detail on my top, along with the pastel pink and white pattern, make for the perfect summer look. If you have a top that is strapless, backless, or that would otherwise show your bra, try an adhesive bra. They’re a game changer for sure, or so much more comfortable than a standard strapless bra. One of the easiest ways to update your summer style is to update your handbag. 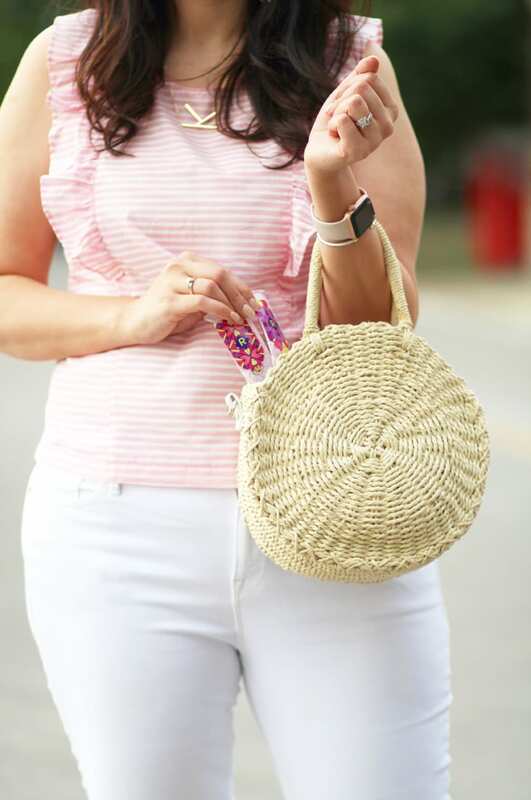 This summer, a round straw circle bag is the must-have summer staple accessory. I have carried this straw circle bag almost every day since it arrived on my doorstep. 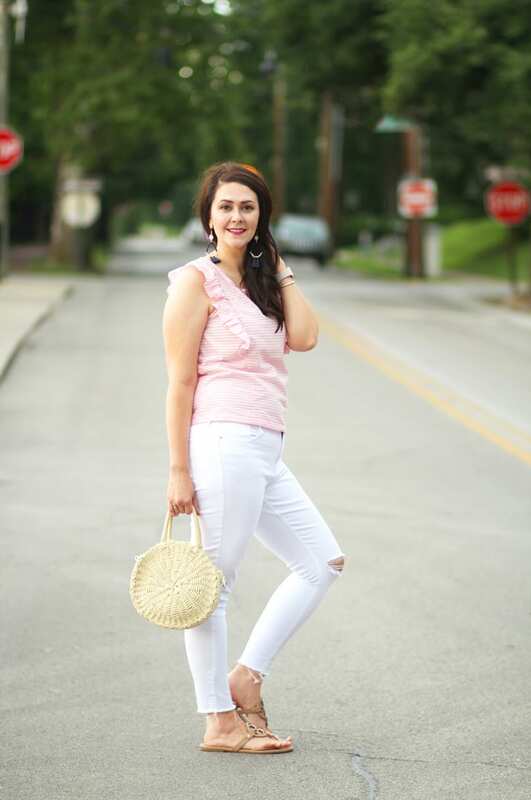 The light color is so fresh and instantly adds that summer vibe to any outfit. It’s a cheap and easy way to update any summer look. And even a straw clutch will easily fit the Tampax Pocket Radiant tampons! When it comes to chic summer footwear, brown leather sandals is where it’s at. Whether they’re tan or cognac, they’ll elevate your outfit to the next level. I have been wearing these flip flop sandals non-stop! I just keep them by the door so I can slide them on quickly. Finally, to achieve awesome summer style, add in some mixed media statement earrings–think a mixture of metal, thread, and/or beads. Statement earrings can stretch your piercing holes, though, so I like to use this product for lobe support. Whenever I wear statement earrings, I like to go with a simple gold necklace so that it’s not overwhelming. If you follow these summer style tips, you’ll have effortless summer style all summer long! Just remember–sometimes what you wear underneath your outfit is just as important as the outfit itself! 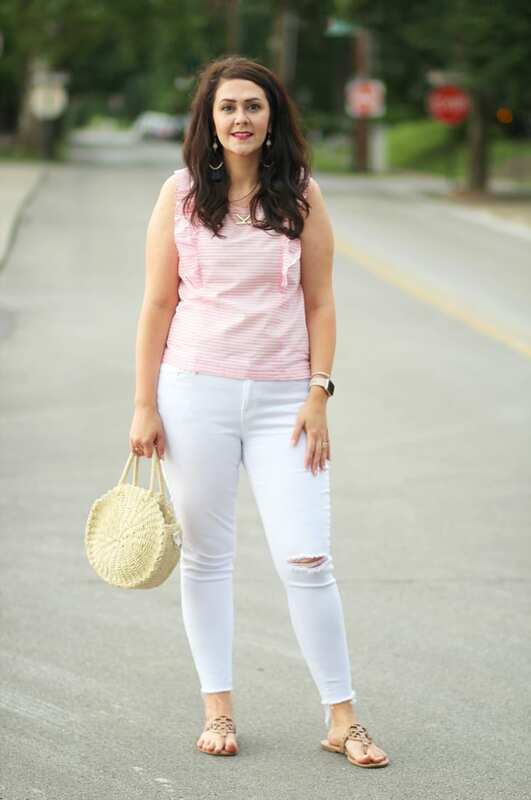 Ahhh you’re braver than I am friend; white jeans are always a no no for me during that time. Such a cute outfit! Love the distressed denim with the stripes. This is awesome! And I love the outfit! White jeans always!! And love the bag! 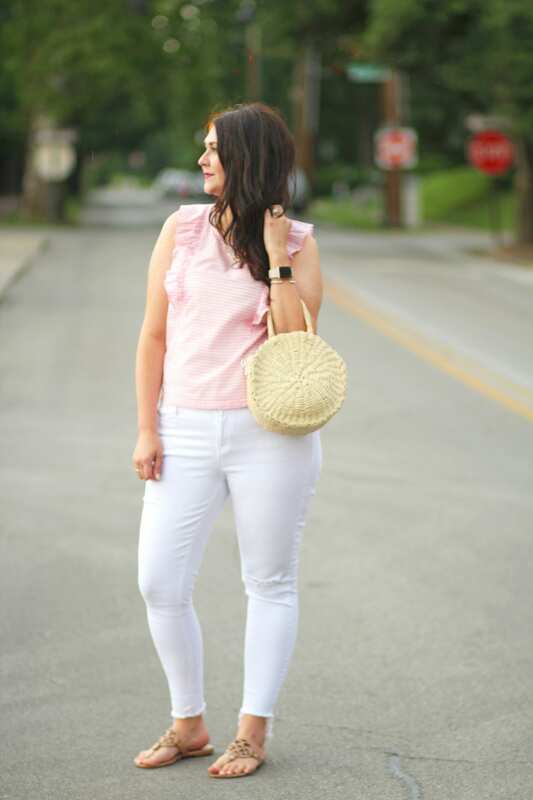 White jeans are a must for me! Love the outfit! Definitely need something under the white for a little extra confidence.